Summer is (almost) here, and now that all major flagships have launched, it means we'll have a few quiet months to enjoy all the cutting-edge gadgets that phone manufacturers bestowed us with in H1. However, it also means that it's time to start looking forward towards the upcoming devices that are destined to shape the mobile landscape in the second half of the year. The Samsung Galaxy Note 4 is a prime example, as the company's phablet line-up has managed to become incredibly popular among smartphone aficionados. Thus, you can imagine the great expectations Samsung has to meet with this upcoming successor - the Note 4. We're starting a bit early here, so leaked data about the next-gen phablet isn't aplenty. However, this isn't to say that there aren't some interesting bits worth knowing already, plus, people are dying to know more about the Galaxy Note 4, so it's our duty to provide! Actually, we think we have a shot at making a rather believable selection of Galaxy Note 4 specs and features that are very likely to end up being part of the final product. For starters, there are some good indications that Samsung will stick with a screen of the same diagonal - 5.7", but the resolution is supposed to hit the QHD level. Want to know more? Browse through the gallery below! It's mind-boggling, but it seems the trend is leading us towards smartphone displays with the stupendously high QHD resolution (1440 x 2560 pixels). The LG G3 has QHD, the Galaxy S5 LTE-A for Korea has QHD, so it only makes sense for the Galaxy Note 4 to have a ridiculously high resolution as well. 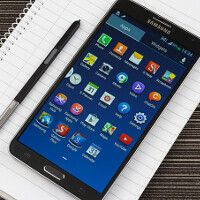 Meanwhile, the screen size of Samsung's next phablet is expected to remain the same, at 5.7 inches. Naturally, that's already quite a respectable diagonal, plus, the company might be hesitant about going bigger than that, since it could make the Note 4 too large. Of course, there's no doubt we'll be dealing with a Super AMOLED display, so get ready for another round of punchy visuals - a trademark feature of Samsung's mobile screens. When it comes to the Galaxy Note 4 camera, expectations are that it's going to be a 16 MP snapper, not unlike the excellent one found in the Galaxy S5. Info is scarce with regards to any other features in the context of the camera, but it's safe to assume that it's going to support 4K video recording. Optical image stabilization is a rumored addition, but then again, OIS has been an expected addition to almost any new high-end smartphone of late, so we're still not quite sure if it's going to materialize. Selfie lovers should expect a modest, 2 MP camera to grace the front of the Note 4, though that's also a rather vague rumor. The long-anticipated Snapdragon 805 chipset is expected to be the silicon of choice for Samsung and the Galaxy Note 4. The first devices with SD 805 are being announced just now, and we really don't expect any other SoC to launch before the Note 4's introduction. Thus, Qualcomm's finest is what's most probably going to power the next-generation phablet, with possible Krait 450 CPU frequencies of up to 2.7 GHz, and a state-of-the-art Adreno 420 GPU. As always, however, Samsung is said to roll-out an alternative variant of the Note 4 in some regions - one that's going to feature a new system chip by Samsung - the Exynos 5433. Typically, users shouldn't experience a perceivable difference in performance between the Snapdragon and the Exynos versions. The Galaxy S5 was Samsung's first flagship smartphone to feature IP certification for water- and dust-resistance. Obviously, we have no reason to believe that these capabilities will be absent from the Note 4. Still, we hope that they won't cause the phablet to grow up in size any further. To add some detail, the Galaxy S5 features IP67 certification, which translates to complete dust-resistance and water-resistance when submerged in up to 1 meter for up to 30 minutes. Like its predecessor and the Galaxy S5, the Samsung Galaxy Note 4 is supposed to include a speedy USB 3.0 port, instead of the usual USB 2.0 that most mobile devices feature nowadays. However, taking advantage of the extra speed will probably require you to purchase a separate USB 3.0 cable, as such wasn't included with Samsung's other USB 3.0-enabled devices. Samsung is generally slow when it comes to enhancing the look and feel of its custom user interface, TouchWiz. Still, the company introduced a rather major redesign and restructuring in TouchWiz with the Galaxy S5. The UI got modernized, flatter, and lighter, plus a bit more straightforward with regards to menu organization. Even then, we still consider TouchWiz to be a rather heavy and cluttered piece of software that could do with a lot more optimization. We'd be more than happy if Samsung streamlines its UI even further with the Note 4, but we tend to believe that the upcoming phablet will stick with pretty much the same software experience. The Samsung Galaxy S5 introduced a new design language for the company, involving pretty much the same front appearance, but replacing the glossy or faux leather style of the back with a new, perforated/dotted pattern. It's a step in the right direction for the exterior of the company's phones, although not really a major break away from what we're used to seeing with Samsung. Of course, small surprises are to be expected, but we think it's relatively safe to say that the Note 4 will feature a design similar to that of the Galaxy S5, especially given the fact that the recently-announced Tab S series of tablets also feature the same design. Rumors are still a work-in-progress for the Note 4. Check back a little later, say around July, for a clearer picture. I hope Sammy includes OIS with the Note 4. Realistically, though, that seems to be a bridge-too-far, seeing as how OIS did not make the cut for the GS5. Everything else spec-wise is where the Note 4 needs to be. Agreed, though I'm a little skeptical about Samsung, at this point, it seems like they may be joining the evil kr. Apple in making everything proprietary and controlling how their phone are used by the End-User. However, I've held off this long on upgrading my Note 2 to 3 because the 4 is just around the corner; I didn't get the Note 3 when it was released because I was holding out for that rumor we all heard here on RumorArena about a 64GB iteration. Anywhoot, iDiGress, waited with bated breath because I really want XLTE; had an S4 for 2 weeks, it was just tooooooooo tiny - felt like I was using was of those iPhones (had to carry a magnifying glass - so unkooool). XLTE when not burdened by a bunch of users, is quite speedy (I have seen ~56 Mb/s with my Droid Maxx). I just hope OIS makes it to the Note 4. Everything else about the Note 4 is looking quite compelling. Don't know, Dougie'. I got an S4 on Craig$list (mint) and in terms of internet speed it blew away my Note 2; XLTE is definitely much more tangible and durable than just creative marketing, it really is MUCH faster than regular 4G LTE. Just couldn't get used to the tiny screen on the S4; I'll probably wind up getting a One Max to tied me over until October (even though the camera is not great!!). lacking OIS is one reason why I got ride of my note 3 and got a 1520 (other than wanting to try windows..) Taking good pictures on that phone other than in bright daylight was damn near impossible. i Kinda want the note 4 to have FHD.. i still think QHD is overrated.. even if its sharper it has its downsides. Go check out reviews of the LG G3 at stuff.tv and cnet, as well as engadget and others. They all say there is a noticeable difference, not huge, but they gave the G3 and the S5 to random people and the testing group said they could immediately spot a difference, albeit not monumental. It is not impossible to see, it is very possible and it DOES make a difference, even if it is a smaller one. Sorry man but i was for the use of FHD.. but on QHD. over 350ppi is always nice, but to overkill with QHD and kill the batterylife even more is stupid. yes i know LG G3 has a good battery life but imagine the battery life if the G3 has only FHD?. IMO QHD is way overkill and we can stay on FHD for 4,7- 6 inch displays, since QHD isn't very well optimised yet. i agree ... extreme high ppi is useless .. kind of gimmicky they should better focus on outdoor visibiltiy , max brightness etc after all resolution is not everything after all . Lol you guys are against QHD on phones that you havent even seen in person or used yet. I cant believe someone would be against new technology without first trying it out. There are dozens of websites that have listed the G3 has the best handset out this year so far specifically due to the fact that the screen is as sharp as it is, and yet performance and battery life do not suffer. A lot of you are just theorycrafting that QHD is a detriment to a device rather than a plus without even trying it out for yourself. There is a reason why even PA gave the phone the highest rating for this year (tied with the Z2) and dozens of other websites have specifically stated that it is the best phone to come out. Stop hating before you see and try for yourself. You cant even understand how good or bad a QHD display is until you see it for yourself, videos cant do it justice either way. Yea ehm, i've both seen the Oppo find 7 and G3 in person. the Store that sells phones close to me is kind of up to date.. they are reviwers and get phones early on.. as i said before its nice and sharp but suffers from its own advantage. Also LG put on Graphene onto the battery so it would last longer.. if they did this with a normal battery maybe it would have been even better. Overkill PPi is Dumb. im sticking to FHD until i QHD actually has a big advantage. Don't forget the preformance loss you get. I fail to see how there is a disadvantage if there is minimal stutter and the battery life isnt impacted. Both of those things were concerns for may reviewers and both turned out to not be problems. Why NOT have QHD if you dont see performance slowdowns and battery life take a big hit? The screen isnt going to be ridiculously better, but it will have advantages to just FHD... All of the reviewers I mentioned stated that they threw a ton of applications and mulitasking at the G3 and it didnt really even skip a beat, so I am confused as to how it "suffers from its own advantage"? QHD means A LOT more pixels.. A LOT more pixels means, lesser preformance compared to something that runs a lesser display with fewer pixels. Also all phones that has been released so far with QHD have had problems with daylight cause the phone needs to get brighter but they aren't able to achive that brightness yet, also higer birghtness means lower batterylife. Sure G3 got good battery life but did you even read my las comment? LG put something on the battery so it would last longer.. something they could have done to a phone with a FHD and even increase that phones battery life further.. Graphene. Also if you aren't squinting your eyes to see the "big" diffrence, why would you even want to go QHD. As i said before.. i'd rather wait until it becomes better. What GPU exynos 5433 comes with??? I hope the design is going to make sense. Some front facing speakers or a very loud speaker.